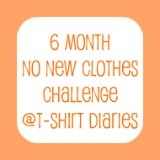 A little late I know, but I wanted to share the results of the No New Clothes Challenge. I survived the month of January and did not purchase anything (well the butterick pattern, but that isn't actually a clothing item yet). So what did I spend my mass quantities of excess money on? One bag of Cipro - on my Ellicotville trip. I know I lead a very exciting life. Jealous? I survived and I didn't even buy clothes for the kidlets. It was hard, but only five months to go. Now to finish that dress (oh yeah I never did get it done before heading to the Dominican Republic). I just ended up wearing an old maternity dress. I was supposed to be wearing that dress I started and haven't finished. Oh and if you haven't had a chance to please vote for round two of Project Recycled. The contest is heating up and you can vote once per day for your favorite.